Some things just look wicked. 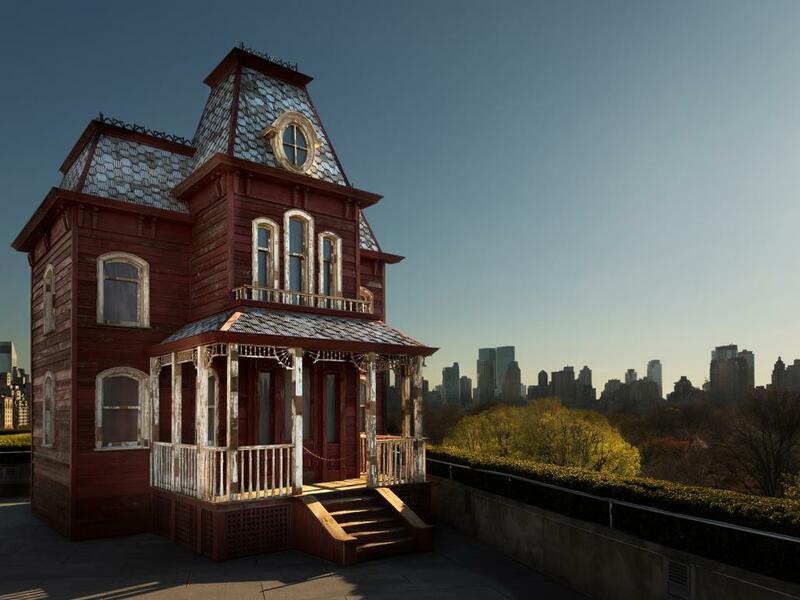 Take the haunted house with its fish-scale shingles, sharply sloped mansard roof, arching windows and looming tower. We all know that terrible things will happen here, but why? Our shivers are largely due to a single painting from 1925, by the American artist Edward Hopper. 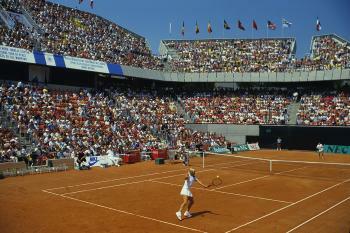 Over the decades, it has inspired cartoonists, film-makers and contemporary artists. Its most recent incarnation is as a sculpture by the British artist Cornelia Parker, exhibited on the roof of the Metropolitan Museum of Art in New York. 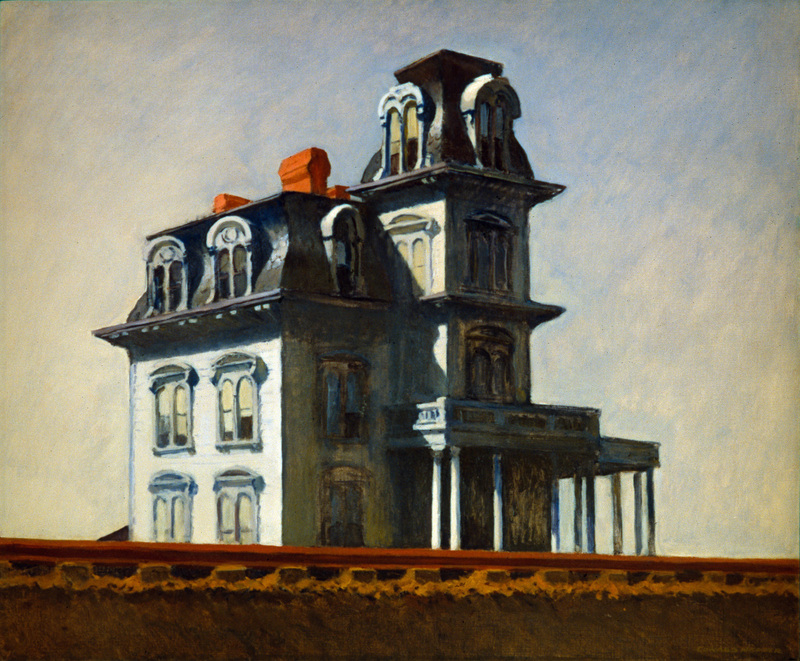 The original haunted house is found in Hopper’s painting “House by the Railroad” (above). It depicts a building of the late-Victorian style standing silvery and pale under an empty blue sky. It is a tall, steepling structure with ill-proportioned windows and ornate pediments. Cold sunlight strikes the house’s left side casting razor-sharp shadows across the veranda, obscuring the entrance. 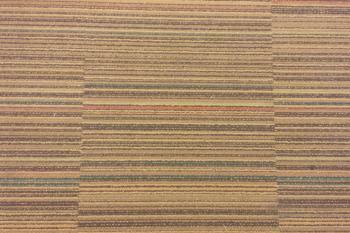 A railway line bisects the front of the picture, further cutting the viewer off from admittance. It appears to be a house that you cannot reach and cannot enter. Its stillness and desolation make you think of a coffin. Hopper painted “House by the Railroad” at a time when Victorian architecture was out of fashion. Tastes had moved away from the overwrought creations of the Gilded Age of the 1880s and on to the sleek simplicity of Arts and Crafts bungalows. Hopper took these aesthetic prejudices and infused them with existential dread. His house is not only out of time but out of place, isolated, empty and alone. He marvelled at how houses can be “more moody than nature…in the daytime they have an astonished look; at dusk they are evil, seem to brood over some crime.” Here he created a symbol of domestic melancholy and dread that has since appeared again and again. The uncanny nature of Hopper’s house was solidified in the work of the cartoonist Charles Addams. Addams began his career painting out the excessive blood in crime-scene photographs published in pulp magazines. He soon found out that he preferred putting it in and started drawing macabre cartoons, notably for the New Yorker. His most famous creation was the Addams Family, a clan of ghouls and monsters who lived – or rather resided – in a bleak, antiquated mansion that was a dead ringer for Hopper’s “House by the Railroad”. It made concrete what Hopper had only insinuated: a building that is vacant but not quite empty. 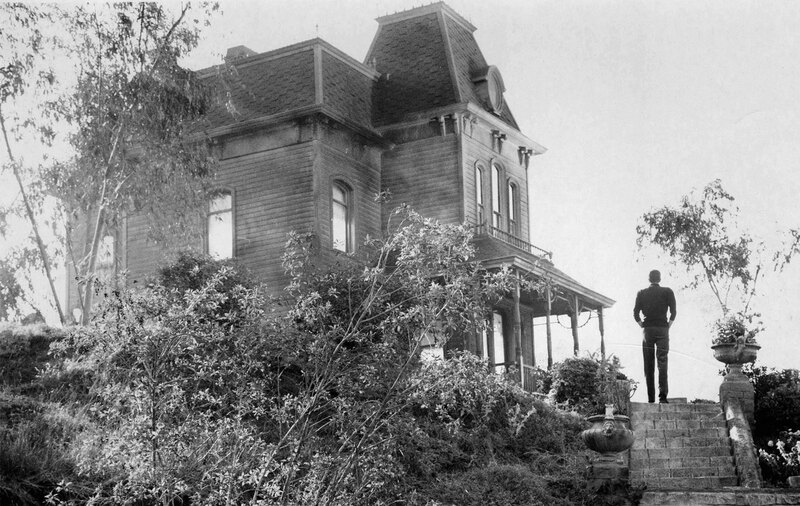 The Hopper haunted house reached its apogee in Alfred Hitchcock’s film, when it became the home of the deranged, cross-dressing murderer Norman Bates. 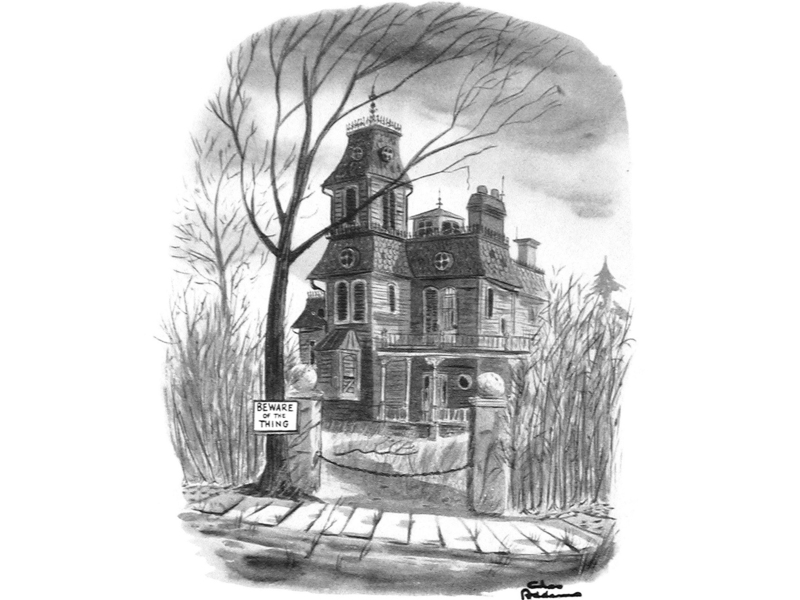 Hitchcock, who was influenced by both Hopper’s painting and his friendship with Charles Addams, depicted the Bates house looming precipitously over the motel beneath it. As in the painting, we look up at the Bates house from below. And just as a train track cut us off from Hopper’s house, so an interstate highway severs the Bates house from the rest of the world. It is the locus of the film, the central character you could even say, a precursor to the quasi-sentient buildings of Robert Wise’s “The Haunting” (1963) and Stanley Kubrick’s “The Shining” (1980). Standing amid fields of wheat, the ornate and incongruous Victorian farmhouse in Terrence Malick’s sumptuous “Days of Heaven” was directly inspired by Hopper’s painting. But while Addams and Hitchcock drew on the house’s cadaverous air to instil horror in their work, Malick preferred to dwell on its isolation. This is a house from the past, a lonely outpost of the old ways, standing apart from time. Malick’s whole film is filled with artful scenes of bygone ages. How fitting that its central image should be a building based on a painting. 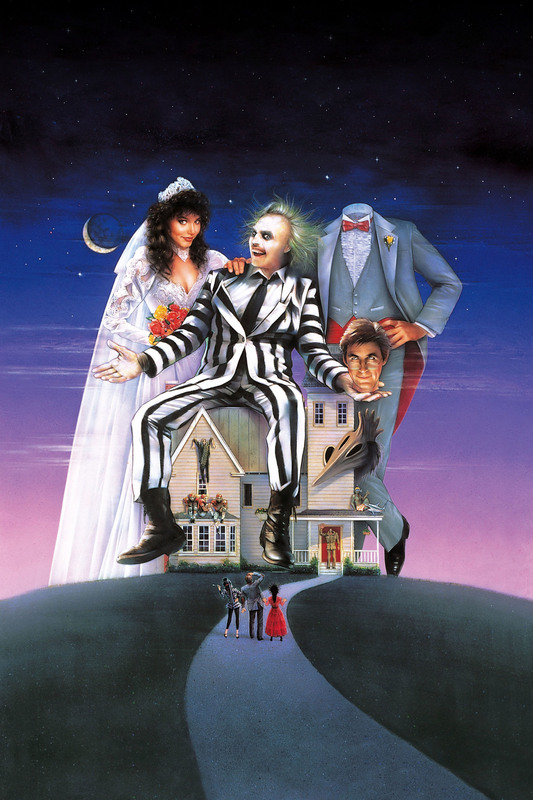 A variant of Hopper’s house of horror appears in Tim Burton’s comedy, yet so familiar had it become by this point that its terrifying tropes were winsomely subverted. The house sits alone, naturally, on a New England hill, but Burton portrayed it less as a venue for terror than as a cosy homestead for the friendly – albeit deceased – couple at the centre of the film. In Burton’s postmodern take on the haunted house it is the new, living inhabitants who add the horror, through the excesses of 1980s interior design. 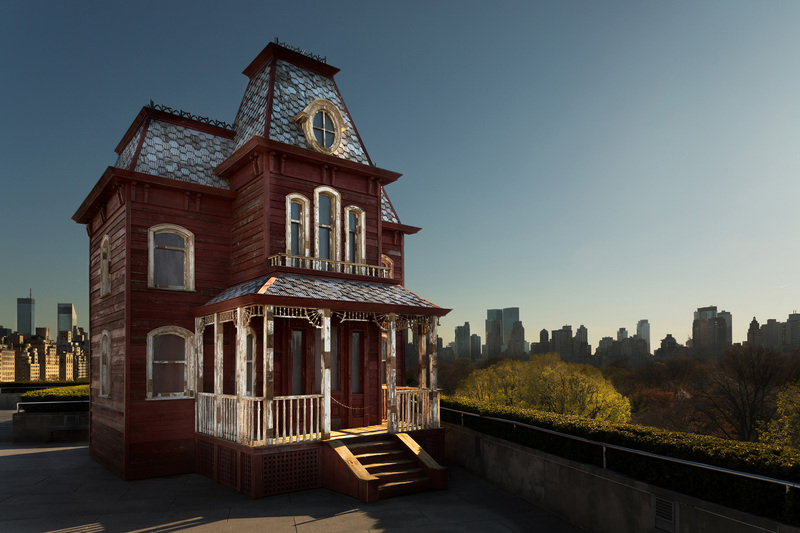 On the roof of the Met in New York until October 31st is a familiar red house. Although it overlooks the verdant green of Central Park, it seems gloomy and foreboding, hunched-up and ready to spring. 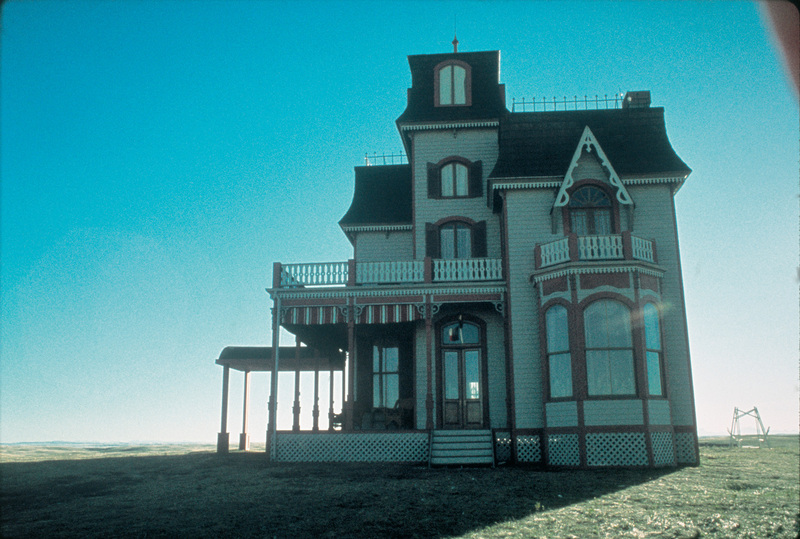 It is in fact a replica of the Bates house in “Psycho”, two-thirds the size, by the British artist Cornelia Parker. Crafted from the wooden siding and rafters of an old red barn, it has appeared here almost like an apparition – a moveable beast, if you will – summoned to deliver a fright in the midst of the bustling metropolis, while at the same time tipping its eaves to its long artistic pedigree.